Horses' eyes can't focus on small objects like we can - they can see far away, but not in great detail, and their color vision isn't that good either. So Zenyatta saw a blur on a small rectangular object that apparently made her owner very very excited, and she picked up on that energy. If Ann thinks Zenyatta has a clue what she was seeing, I have to question her sanity. amfuller wrote: News from Mayberry Farm!!!! Cozmic One is certainly growing up to be a nice looking horse. Seems like a very chill one too, like Zen herself. The last part...yeah. But you know, to her Zenyatta is a pet and I think most pet owners are guilty of anthropomorphizing them to some degree. ::raises hand:: I know I am with my cats. Sometimes it just really seems like they understand, even though on a rational level you know they don't. Z13 sure does look good. I love the sound, listening to Zenyatta eat her peppermint. And Z13...man he is one classy looking colt. He was classy looking from day 1. Even in a group photo, one's eye is drawn immediately to him. We don't know what he's like in the herd, if he's a leader or follower, but it sure is hard for me to take my eyes off him. Got to be patient, but I'm really anxious to see him run. Ridan_Remembered wrote: I love the sound, listening to Zenyatta eat her peppermint. And Z13...man he is one classy looking colt. He was classy looking from day 1. Even in a group photo, one's eye is drawn immediately to him. He's the leader of the group! One of the people that won the trip to visit Z and Z13 said he was defiantly the leader. His head is higher. He looks more alert. The others appear somewhat uncertain. Delamont wrote: His head is higher. He looks more alert. The others appear somewhat uncertain. Or it could just mean that he's more reactive to outside stimulii (spookier). That has nothing to do with leadership--which in horses doesn't really apply anyway. They're about dominence and pecking order within the herd, not leadership. "Leader" in this context is just another way to say "alpha" or "dominant." From day 1 this colt has shown great curiosity about the world around him. We all know that, in general, horses are not high on the intelligence scale compared to other species. But within the range of equine intelligence, Z13 has always seemed quite smart. Now maybe I'm reading too much into the photos and occasional videos we've seen of him, but to my eye he has no trace of spookiness, but has class written all over him. Whether or not that translates into racing talent, only time will tell, of course. The colt on the right sure was behind the door when looks were passed out! Z13 resembles his dam with that head in the air watchfulness. The colt on the far right looks younger than the others. BornToWin wrote: Z13 resembles his dam with that head in the air watchfulness. 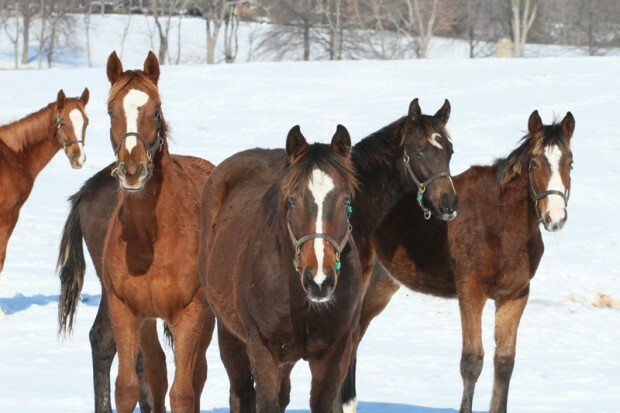 The colt on the far right looks younger than the others. The "head in the air watchfulness," as you put it, seems to be a fairly common trait among top class racehorses. I'm reminded immediately of John Henry, but there are other examples. Man o'War had the same trait, even as a young foal. I thought I read on the Zenyatta forum that it was around April 15th. She looks like a brick with legs! And a muddy brick at that! I just read some of the comments on the photos from zenyatta.com for the first time. I'm guessing that there are a lot of people who like Zenyatta but have nothing better to do than post on her website all day. They have discussions about what their dog had for dinner, who is going to win Dancing with the Stars, and what is going on with the missing Malaysian airliner. Almost nothing has to do with Zenyatta, it's just a bunch of people using the comments section of the site to chat with each other. Kind of bizarre. BlindLucky wrote: I just read some of the comments on the photos from zenyatta.com for the first time. I'm guessing that there are a lot of people who like Zenyatta but have nothing better to do than post on her website all day. They have discussions about what their dog had for dinner, who is going to win Dancing with the Stars, and what is going on with the missing Malaysian airliner. Almost nothing has to do with Zenyatta, it's just a bunch of people using the comments section of the site to chat with each other. Kind of bizarre. I read your comment and looked at Zenyatta.com. Under forums it lists the following topics on the first page. I quickly looked at several, though not all. They seem pretty much on topic, although I suppose they could go off like some of ours do. Whats the best name for 13Z? Picture doesn't show. Too many ]]]. islandgirl45 wrote: I read your comment and looked at Zenyatta.com. Under forums it lists the following topics on the first page. I quickly looked at several, though not all. They seem pretty much on topic, although I suppose they could go off like some of ours do. To all of our Sherlock Holmes and Watson’s on here. What do you all think is going on with this missing Jet Liner. It’s so horrific and terrible for so many reasons. To all the people affected I have you so much in my prayers, but I just can’t get past the system being turned off. Programing of the plane to turn. Alright Goodnight. …………….Just Baffling. No country , Picking up anything conclusive happening to it. No crash seen by radar.. I guess we have to put on our Detective hats.